During a quick visit to the Burnie area last week I managed to 'capture' Scanias 400 & 401 operating the Wynyard service. 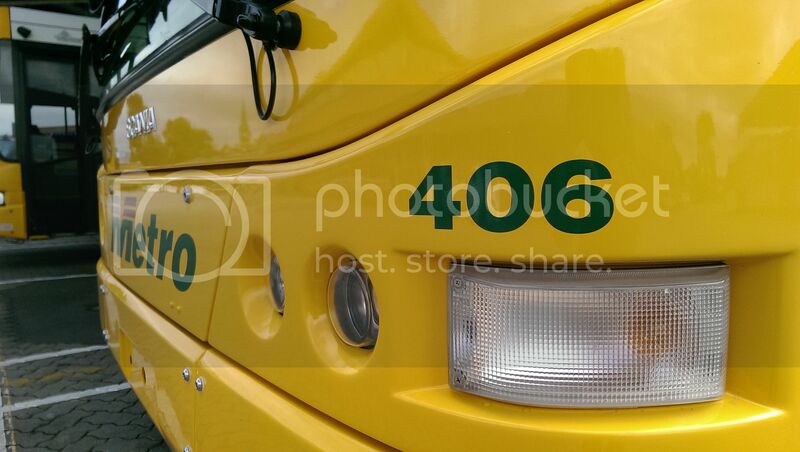 Other buses noted were 10,12,204,205,208,213,215,628,629,630,632,636. Former fleet members not sighted were 244,631,633. A 3rd Volgren was noted parked in the depot yard. Noted in the depot scene is a bus using the Wellington Street exit. 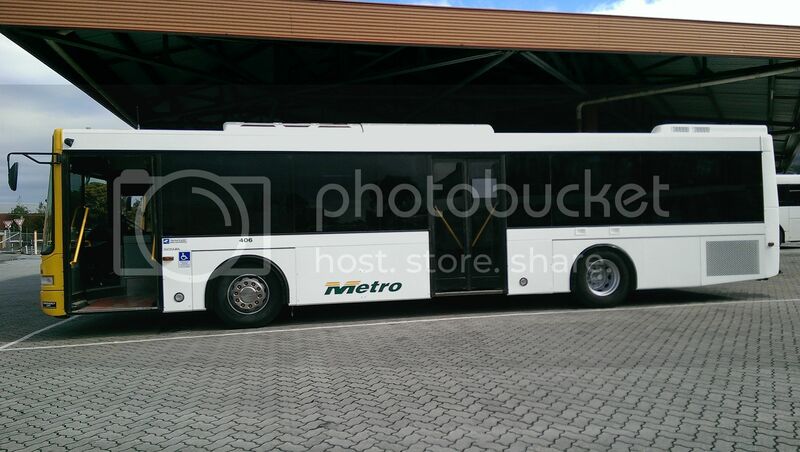 This confirms my suspicion that Metro Tas are just copying the Admet fleet. First CR224Ls, then CB60 Evo IIs, then CB80s, now I find that they also have CR228Ls, say, are they planning on getting any double deckers? Lt. 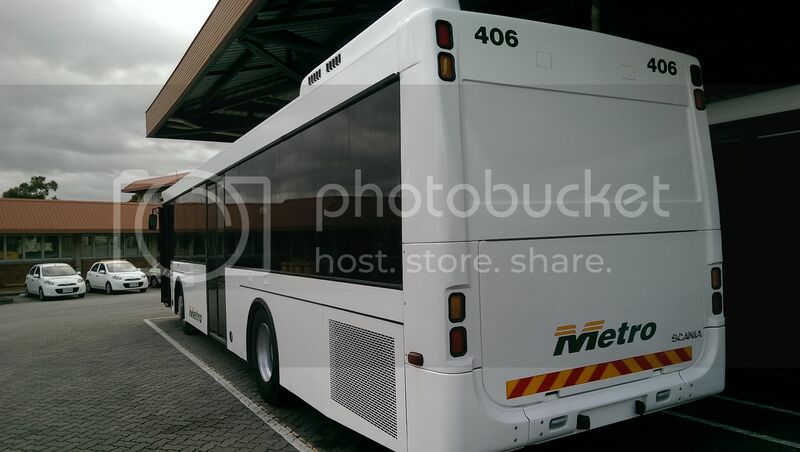 Commander Data wrote: This confirms my suspicion that Metro Tas are just copying the Admet fleet. First CR224Ls, then CB60 Evo IIs, then CB80s, now I find that they also have CR228Ls, say, are they planning on getting any double deckers? I thought that I would hold off answering this one in case a 'fellow Tasmanian' participated. Metro Tas was probably [most likely] the first operator of Scania vehicles in that they trialled a PMC bodied Scania in Launceston in 1987 [No.251] and placed an order and took delivery of Ansair bodied Scanias from 1988 [No.101 onwards] well before Admet changed to Scania buses [No.1200] in 2005. So therefore replacement vehicles naturally would include the versions mentioned in your 'suspicion' message above. The Burnie CR228L buses [No. 400-408] are really quite a 'stunning' move in that Burnie was operating older Scania vehicles but with low kilometres compared to similar Hobart vehicles, that would better serve Hobart [or Launceston] as they will be 'on the road' longer there than in Burnie. In the meantime Burnie obtains a younger fleet [apart from No.244 which was a 2007 model]. The Volgren fleet are 2006 built vehicles although they may have accumulated some km around Tullamarine since then. Adelaide's Scania fleet continues to grow like Tassie's so Metro really did their homework back in the 1980's to 'copy Admet' as you remarked! A slight correction... Adelaide got its first Scania bus (3269, L94UB/Volgren CR224L) in 1999 (excluding a demo, mentioned later), two years before Metro Tasmania's first L94UB/CR224L (201, built June 2001). So in that sense, the observation of Tasmania "copying" Adelaide is valid, albeit only in the "modern" era. 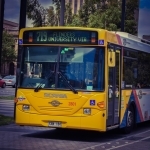 One could also mention the PMC-bodied Volvo B10M and B10ML fleet which Tasmania received about 4-5 years after Adelaide got theirs. As mentioned earlier, #406 spotted "loitering" around Metro's workshop, albeit long way from being ready. Here are the photographs. During a further short visit to the coast in May I photographed a few more Burnie Volgren Scania CB228L's in Burnie and Ulverstone [ex Tullamarine long term parking]. A few more photographs of the 'new' second hand Burnie Scania Volgren fleet taken during my brief visit to the Burnie area, Oct/Nov 2016. The fleet has obtained some advertising 'noise' and only a handful of buses are not carrying this vital source of revenue. MET-406 is photographed in Rooke Street in Devonport operating a new service Route 85 [Burnie Hospital to Latrobe Hospital]. I seem to have now captured all members of the 'Volgren' fleet except MET-403 but there is always room for a few more. Last edited by LocoLes on Wed Nov 09, 2016 8:35 pm, edited 1 time in total. They are nice shots, although seeing a yellow CR228L near a beach is a strange sight for me . CR224Ls will always look, sound. and perform better than 228Ls for me though. Scania MET 403 CR228L [Volgren] had escaped my camera for so long but here it is at Mount Road, Upper Burnie, all 9 Scania Volgren Burnie fleet now recorded. #409 and #410 in Hobart, both K230UB / Volgren CR228L, unlike the Burnie units which are all L94UBs. 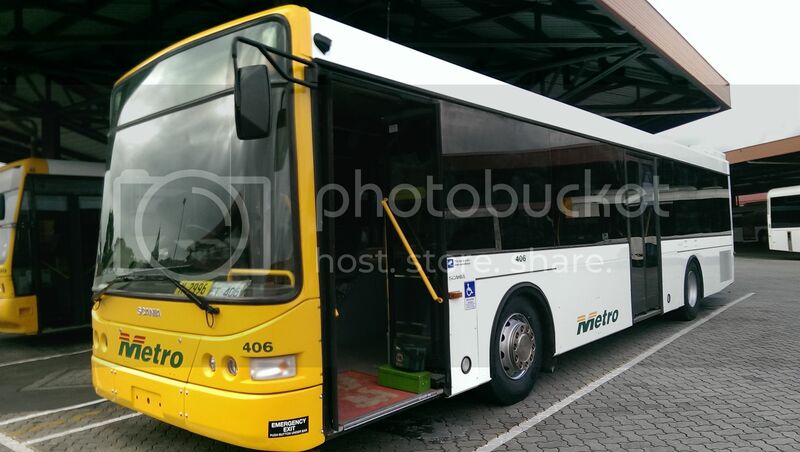 MET-405 is pictured at Ulverstone's central bus stop in Wongi Lane recently fitted with a windscreen protector. Noticed also MET-402 is similarly fitted suggesting flying stones are encountered on the Hospital run to Latrobe. MET-405 is operating route 85 to Burnie.